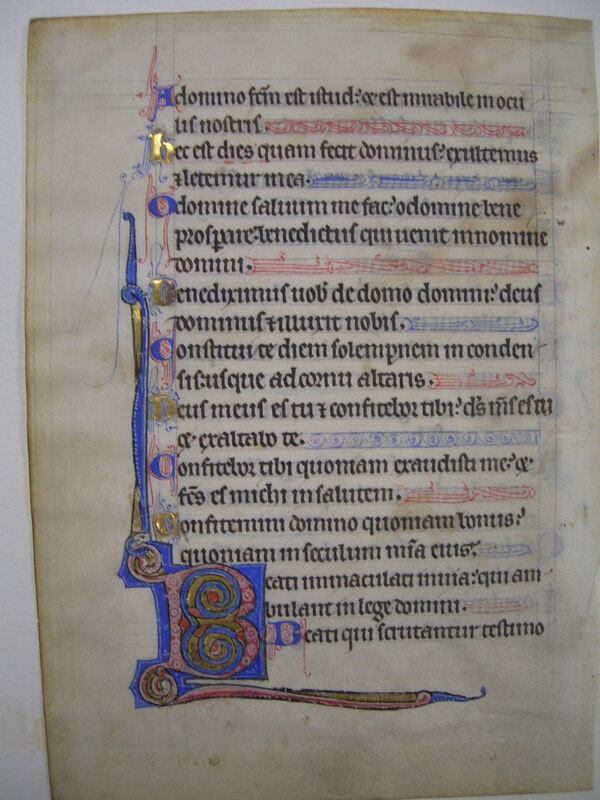 Text: Psalms 117:12-117:22 (recto) and 117:23-118:2 (verso). Reconstruction Note! 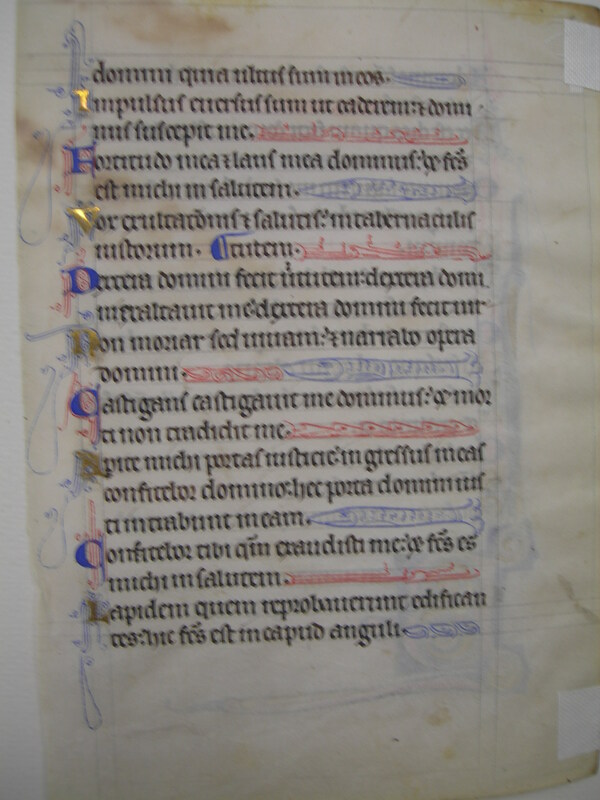 In Ege's original psalter, this leaf followed what is now Leaf 10 in the University of Saskatchewan portfolio, and was followed by what is now Leaf 10 in the Rochester Institute of Technology portfolio. Placed back in sequence, the three leaves contain the text of Psalms 115:4 to 118:22. Dómini, quia ultus sum in eos. Confitébor tibi quóniam exaudísti me, et factus es mihi in salútem. Lápidem quem reprobavérunt ædificántes, hic factus est in caput ánguli. ...Lord I was revenged on them 13 Being pushed I was overturned that I might fall: but the Lord supported me. 14 The Lord is my strength and my praise: and he is become my salvation. 15 The voice of rejoicing and of salvation is in the tabernacles of the just. 16 The right hand of the Lord hath wrought strength: the right hand of the Lord hath exalted me: the right hand of the Lord hath wrought strength. 17 I shall not die, but live: and shall declare the works of the Lord. 18 The Lord chastising hath chastised me: but he hath not delivered me over to death. 19 Open ye to me the gates of justice: I will go into them, and give praise to the Lord. 20 This is the gate of the Lord, the just shall enter into it. 21 I will give glory to thee because thou hast heard me: and art become my salvation. 22 The stone which the builders rejected; the same is become the head of the corner. A Dómino factum est istud, et est mirábile in óculis nostris. Hæc est dies quam fecit Dóminus; exsultémus, et lætémur in ea. Benedíximus vobis de domo Dómini. Deus Dóminus, et illúxit nobis. Deus meus es tu, et confitébor tibi; Deus meus es tu, et exaltábo te. 23 This is the Lord's doing: and it is wonderful in our eyes. 24 This is the day which the Lord hath made: let us be glad and rejoice therein. 25 O Lord, save me: O Lord, give good success. 26 Blessed be he that cometh in the name of the Lord. We have blessed you out of the house of the Lord. 27 The Lord is God, and he hath shone upon us. Appoint a solemn day, with shady boughs, even to the horn of the alter. 28 Thou art my God, and I will praise thee: thou art my God, and I will exalt thee. I will praise thee, because thou hast heard me, and art become my salvation. 29 O praise ye the Lord, for he is good: for his mercy endureth for ever.